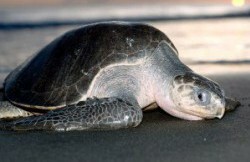 Olive Ridley Sea-turtle (Lepidochelys olivacea), named for its olive-colored shell, is a vulnerable species due to their estimated 31% – 36% decline over two generations before 2008. These sea-turtles nest in as many as 60 countries throughout the world, and migrate through the Atlantic, Indian, and Pacific oceans. There is general global decline rate is breeding and nesting Olive Ridley populations, which reflects a widespread low conservation status for the species. This suggests that the species has not recovered to historical (pre 1960) levels even in regions with long-term protection programs, and in spite generalized increments over the last decade. Olive Ridley turtles are threatened by unsustainable egg harvesting for personal consumption and commercial use. In several countries, laws against harvesting sea-turtle eggs have insufficient enforcement, and up to 100% of Olive Ridley eggs are harvested in some regions. 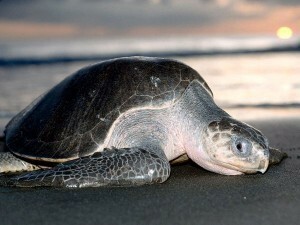 Additional threats include intentional and accidental capture of sea-turtles and destruction of their natural habitats. In some areas there is some evidence that thousands of adult Olive Ridley Sea-turtles are captured each year and sold in local and regional markets. Links to conservation of other species of sea-turtles, we have been working on Olive Ridley conservation at Paloh Beach in West Kalimantan, Indonesia. We are also initiating conservation efforts in the Akassa coast, Niger River delta on the southern coast of Nigeria. Both conservation efforts include providing support to local community conservation initiatives to protect breeding populations, nests, and hatchlings. The conservation program in Akassa also includes promotion of livelihood alternatives to egg harvesting, educating communities on conservation needs, and training patrol groups to protect the sea-turtles and their nests.